We find that the distributions for ∆t ≤4 days (1560 mins) are consistent with a power-law asymptotic behavior, characterized by an exponent α≈ 3, well outside the stable Levy regime 0 < α <2. .. For time scales longer than ∆t ≈4 days, our results are consistent with slow convergence to Gaussian behavior. We observe that if we exit this trade within 4 days of entry, the average loss (i.e. the cost of hedging) is in the range of -0.2% to -0.4%, i.e. an average of -0.29% per trade. 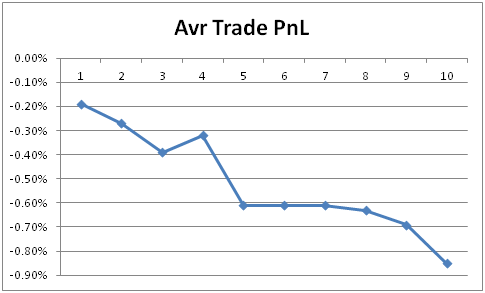 From day 5, the loss becomes much larger (more than double), in the range of -0.6% to -0.85%. The smaller average loss incurred during the first 4 days might be a result of the fat-tail behaviour. This test shows that there is some evidence that the scaling behaviour demonstrated in Ref  still holds true today, and it manifested itself in this system. More rigorous research should be conducted to confirm this. Gopikrishnan P, Plerou V, Nunes Amaral LA, Meyer M, Stanley HE, Scaling of the distribution of fluctuations of financial market indices, Phys Rev E, 60, 5305 (1999). Is Asset Dynamics Priced In Correctly by Black-Scholes-Merton Model? rvarb on Is Asset Dynamics Priced In Correctly by Black-Scholes-Merton Model? claudiu on Is Asset Dynamics Priced In Correctly by Black-Scholes-Merton Model?